For those who are avid readers wanting to expand their professional library for free, here's an opportunity of interest. ASCD has launched their first ever Pin to Win Contest with Pinterest. 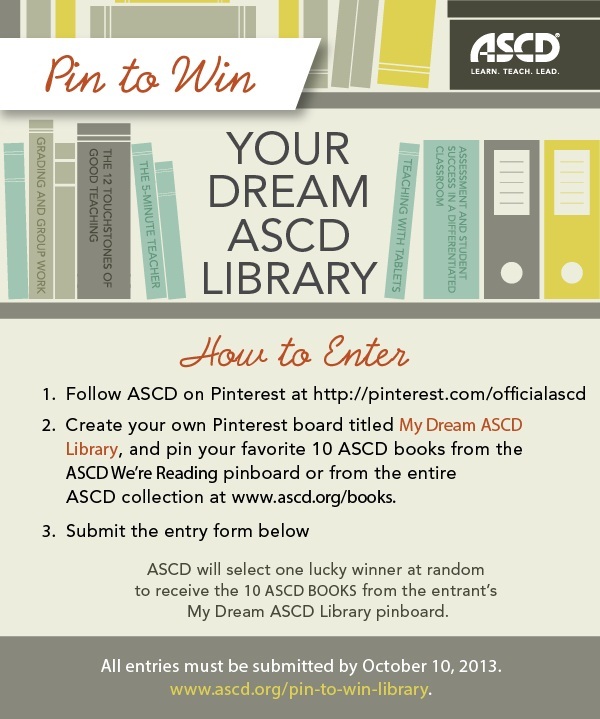 Winners can win 10 ASCD books by creating a wishlist of books called "My Dream ASCD Library" pinboard in Pinterest. The contest runs now throw October 10. This is an excellent opportunity for educators to get copies of books from their favorite ASCD authors for free. For more information check out the graphic below. SONIC'S Limeades for Learning Project: Get Your Teaching Project Funded! SONIC Drive-In has announced once again their project, Limeades for Learning, which is a philanthropic initiative in partnership with DonorsChoose.org that funds teacher projects to pay for necessary supplies and tools that might otherwise be paid for out of their own pockets. With this year’s funding, SONIC will have contributed more than $3 million to this initiative. SONIC customers can make a difference in their local communities by voting online Sept. 23, 2013 through Oct. 27, 2013, atLimeadesforLearning.com, for their favorite projects submitted by teachers in need. In 2013, more than a half million dollars in SONIC donations will go toward public school classroom projects around the country this year! 1. Create an account on LimeadesforLearning.com with a valid email address and receive one vote per day. 2. Visit a SONIC Drive-In and receive two extra vote codes on a bag sticker. 3. Vote online 10 times and get two extra vote codes via email. Empower: Should We Use That Word as School Leaders? I never really thought about the negative connotations that the word "empower" has until I read Mark Adams book Courageous Conflict: Leading with Integrity and Authenticity. He makes sense when he points out that empowering someone means you are "temporarily giving them the power to do something, but that they really do not own it or possess it." It ultimately does mean that the one who is in a position of authority is granting those under his charge the authority to make decisions or take actions. Leaders like to throw around the word "empower" like it is some dispensation from on high, yet it does have the slight taint of "You can only do this because I have granted you the power to do it." Adams cautions leaders about throwing around such terminology. It can serve to actually undermine trust and morale. The word "empower" itself, suggests that the one on which power is granted is not on equal footing with the one granting that power. That's certainly fine if your intention is maintain a more authoritarian stance in regards to those you lead, but do not pretend that you are acting from a "servant leadership position" or that you are fostering a "team-like collaborative approach" to management. I suggest that we perhaps use terminology less loaded with this authoritarian bent. Words like entrust or simply calling it like it is: the person was granted the authority to take action. I think leaders, especially in educational leadership, do a great disservice when they try to mask or otherwise make practices seem something they are not. They often try to use business terminology that does not quite capture the action, or they use terminology that sounds innocuous at first glance, but that language has meanings not intended. Authenticity and courage in leadership means being honest and authentic in our language too. We don't engage in using words like "empowerment" unless of course we know the full meanings and connotations of words. Don't call yourself a "servant leader" unless you actually do take on qualities of being a servant to those you follow. Our authenticity as leaders begins with the language and buzzwords we use. I, for one, do not like the word empowerment. How can we avoid becoming robots in the classroom and in our school offices when all the talk is data, data, and more data? When all the educational buzzwords are the same words and language used to describe mechanistic processes, it is easy to lose sight of education as a process involving real people with real inner lives. To avoid becoming these automatons of a lifeless education system, we do need to take time to work on the inside too. No matter what your religious persuasion or lack of, teaching is ultimately an act of integrity and courage that pours as much from our hearts as our heads. How many times a day do I find myself caught up in messiness of administrating, only to lose touch with what's inside? Yesterday, I shared much of the following with my staff in my weekly email update. Parker Palmer, author of the inspirational book on teaching entitled, The Courage to Teach, talks at length about the importance of teachers, and I would add administrators, to being in touch with the teacher within. Teaching is an authentic, powerful experience that requires a level of authenticity. To be authentic, we must listen to the teacher inside us. "How does one attend to the voice of the teacher within?" With this question he encourages teachers to make sure they tend to what's inside too. He says we can only touch students' lives when we ourselves are on "speaking terms" with this teacher within. To do that, we need to take occasions to listen inwardly. Find some time for solitude and silence. We all need time to sit quietly and in silence so we can learn to hear the voice of the teacher within. Meditative reading. We need to take the time to read things that inspire us, and that give volume to the voice of the teacher inside all of us. Walking in the woods. This weekend take a hike, well, don't take that the wrong way. Take a walk in the woods. Give yourself time for inner reflection after spending the entire week of interacting outwardly. Journal. Take some time this weekend to write. Give that teacher within a voice. Finally, find a friend who will listen. There's nothing like a compassionate friend to help you reconnect to the teacher you are inside. Palmer talks a great deal about the importance of teaching coming from our identity and integrity. We must be authentic with ourselves before we can ever be authentic with our students. This weekend take some time to get on speaking terms with your teacher within. What are some outmoded educational practices and ways of schooling that we need to change the most? Like the concept of "seat time" mentioned above, many of our ways of doing school and educational practices are obsolete. These obsolete practices are still embedded in many of our schools and need to be changed because they perpetuate the same kinds of teaching and learning from the old industrial model of schooling that fails to adequately prepare our students to engage life in the 21st century. Here's a list of those "Obsolete Practices." 1. The idea that more seat time = higher achievement. This assumption manifests itself in many ways. Advocating for a longer school day, longer class periods, longer school calendars, and any other scheme to try to “increase the amount of time students spend in the school building” are schemes to increase seat time. It's high time we gave up this assumption because it is simply not true. What matters the most is the quality of the learning activity the student is engaged in and the quality of the instruction. The reason studies on seat-time schemes like block scheduling and extended afterschool have not shown definitively that they work to increase achievement is because in each of these what really matters the most is the kinds of learning activities students engage in. If increased seat time only involves exposing kids to more passive learning activities instead of getting them learning actively, then there will be little return on the increased time invested. 2. Give up the idea of what Ron Nash calls, “Seeing Learning as a spectator sport.” Too often too many people see the students as passive recipients of the learning instead of active participants. As Nash points out, “When teachers talk, students often go to a better place in their minds.” They’re checking out in these passive learning classrooms and then both teachers and administrators wonder why students’ attention spans are so short. It’s time to view learning as something students engage in and not something students are subjected to. 3. The idea that teachers should be center-stage and in control of every aspect of the classroom. Yes, teachers need to focus on providing a safe and environment conducive to learning, but the most effective 21st century learning places are not places of strict control. They’re places where learning often looks messy and chaotic and failure is acceptable. As Nash points out, these “command-and-control” classrooms are not conducive to creativity, exploration, and inquiry. They are more about conformity and keeping the status quo in place. 4. The idea as Nash points out that “when the bell rings, we move from math to English.” Whose life is organized by subject areas and departments these days? Yet, we still shuffle kids through a system of bells throughout the day in a type of learning that is artificially compartmentalized. Instead, we need a system where we don’t run around like condition rats through mazes when bells ring. We need personalized schedules of learning where students also have time to explore and engage in inquiry-based activities that are real and authentic and not confined to the artificially compartmentalized, industrial-age system we have now. 5. The idea that teaching to the middle is an effective instructional strategy. This idea has long served its purpose. Nash points out that when teachers use this approach, they end up leaving those who need to move at a more rapid pace, bored, and those who need a slower pace end up being lost. Instead, when need personalized learning for all students that pushes them to learn as they can. I’m positive there are many more instructional practices from the industrial-age model of schooling that can be piled on this slag-heap. But, we continue to insist on measures based on these outmoded ways of thinking about education. If we’re ever going to truly impact learning in the classroom, we’re going to have to change these fundamental ideas about schooling. As Marc Prensky once pointed out, “I often liken this to Federal Express: you can have the best delivery system in the world, but if no one is home to receive the package, it doesn't much matter.” In education, we have all these schemes of command-and-control and to efficiently move students through the system, but in the end, if they’re not engaged, what’s the use? In a post to Education Week entitled, "Encouraging Educator Courage" Alfie Kohn calls on educators to be courageous in the face of outrageous mandates and policies that are being foisted on their schools and districts in the name of education reform. While I would not encourage anyone to go as far as to put their jobs on the line, I do think we need to work to change mandates and policies with which we disagree, and that does not mean to quietly implement them without letting those who push them that we disagree. Kohn points out one thing that courageous educators can do in the face of these mandates and policies; they can "dig deeper" which means asking the tough questions and not settling on just any answer that comes to us. We need to be critical of the reasons and evidence given to us just like would with any proposed idea or educational practice. It also means not accepting the arguments made from authority and power. If mandates and policy passed down to us are good for kids, then the burden of proof that that is so is on those proposing. Giving students starter projects at the beginning of the school year is vital to make sure they learn the mechanics of project-based learning, collaboration, and engagement. It is the project scaffold that makes future project-based learning instruction more fruitful. This morning, during class visits, one of our world history classes was engaged in creating "Who Am I?" projects, which are designed to frontload these PBL skills. These questions are ideal in many respects. For example, they tap into ninth graders interest in themselves, and to place these questions in the context of a project makes this first venture into PBL especially relevant. In addition to exploring these questions, students were also asked to create a presentation as their product for the "Who Am I?" project. To further scaffold the assignment, they were provided an outline to follow regarding how they should structure their presentations. Students were also asked to use PowerPoint to create these presentations to allow a deliberate focus, not on learning software, but on working through the PBL process. Some students who asked to use other presentation tools were not prohibited from doing so. The "Who Am I?" project is an excellent starter project for freshmen high school students for several reasons. 1. In my experience, freshmen love engaging in assignments that allow them to talk about themselves. It is developmentally appropriate to tap into this natural fascination with themselves and their own lives. 2. This project gives students a scaffold on which to learn the skills of putting together a project and giving effective presentations. Students aren't confronted with all the complexities of PBL all at one time. 3. Students use familiar technological tools, instead of attempting to engage in project creation and learning new technologies with their first project. 4. Students are provided with a non-threatening, less content-connected project for their first one so that they can learn the mechanics of PBL first, before engaging content as well. Structuring students' first PBL experiences to minimize threats and insecurity is important. Deliberately teaching PBL processes up front is a must if future projects are going to be successful. It is equally important for each teacher to teach students what project-based learning means in their individual classrooms as well. In the early days of my career, as an assistant manager with a large retail chain, I fondly remember a mentoring, veteran store manager telling me, “You know, you get better at this managing thing. You just gotta get comfortable in your own skin.” As is often the case when one is young, that whole statement flew right over my head. I honestly had no clue as to what he was talking about. Now, many years later, with hundreds of additional hours of work experience, I know exactly what he was referring to. He was basically talking about being comfortable with who you are in the role of management and in life. What Moffit describes in that statement, is the ultimate state of “being comfortable in our own skins.” Further, he describes an end to our fighting to try to mold our lives into what we think it ought to be, and instead, being friends with our lives, accepting our lives and ourselves. But this is not a passive resignation to not ever trying to better ourselves; it is putting an end to our our constant reactivity and resistance to all that comes our way" and being friends with it all. Below, I've taken the liberty of slightly modifying Moffit's list of nine benefits of skillful living and generated my own list of "9 Benefits of Living in Our Own Skins" advice to school leaders. 1. We know and act from our core values at all times. If we’re living skillfully, we are “comfortable in our own skins” and do not pretend to be someone we’re not. We don’t forget our inner core when we make decisions. We walk the talk because we authentically adhere to our most sacred values. There are no sacrifices of our most important values for personal and private gain. 2. We gain wisdom from both pleasant and unpleasant experiences. Life is our teacher. As leaders, every experience, whether it be difficult or not, is our instructor about life and about ourselves. Those we encounter that try our patience, that test our values, are our teachers too. When we live skillfully, we are open to the lessons that life and these people bring. 3. We can discern between thoughts, words, and actions that can cause harm and those that do not, and we act accordingly. Living skillfully and “being comfortable in our own skin” means we are in tune with what’s happening in our minds. We know clearly that what we say and what we do has the potential to cause harm, and we refrain from those. We speak and act only after examining our motives and intentions, and when we know no harm will come to others due to the choices we make. 4. We know our true nature, the essence of our character, and how to protect it. You can’t possibly be comfortable “in your own skin” if you really don’t know yourself. In essence, we are not our school leader roles. We are much more, and if we live skillfully, we are in tune with all. Taking time to know ourselves is important. Annual retreats and time for reflection each day are a must. 5. We accept gain and loss equally and derive insight from each. We don't always have to win. We also accept losing as well. There is much to learn from the wins and losses in life. Living skillfully means we face both of these and use them as opportunities to learn more about ourselves and life. 6. We realize that we have an inner life in which love can flourish, even if our outer life is filled with challenges. School leaders seldom speak of “love” because setting aside your feelings and sentimentality is often thought to be a sign of good leadership. In fact, authentic leaders realize the value of inner lives. It is through the cultivation of the inner life that makes possible the ability to withstand the challenges of our outer lives. When the worst happens, what's inside us is tested, and what comes out determines our authentic selves. 7. We learn to speak only what is true, and timely, even during moments anger and outrage. Living skillfully means not sugar-coating our feelings or what we see. Nor does it mean we let our words fly in anger no matter where they land. Sensitivity means we may speak the truth, but with finesse and concern about how our words affect others. We learn to say what we see and feel as the truth, but we do so when time and opportunity allow us to do so skillfully. 8. We are not controlled by our views and opinions, instead we have a “don’t know” mind that responds wisely to life’s encounters. Living skillfully as school leaders means our views and opinions don’t drive us. We know we don’t know what we think we know. This doesn't mean we plead ignorance, but it does mean we approach what we know with a tentativeness that says I know I don't always know what's the best. It's being open to the possibilities. With the attitude of “I don’t know mind” we approach our leadership with a humility that makes our decisions take on a new level of wisdom. 9. Finally, we have the ability to soothe ourselves when we feel disappointed and overwhelmed in life. We are skillfully living “in our own skins” when we take the time to apply medicine to ourselves when disappointments come. When the pressures of leadership overwhelm us, we acknowledge them and say to ourselves, “It is OK. You’ll be OK.” Soothing ourselves means we don't accept the wounds of leadership as inevitable. We put salve on our wounds and take care of ourselves. Earlier, I posted in "We Must Redesign Our High Schools Or Else!" that we needed to redesign our high schools, or risk losing more and more students to other options. "The one-size-fits-all factory assembly-line high school is perfect for producing credentialed students, but often falls short of meeting the needs of all students." Instead of having a single high school model, we really need multiple models and multiple sizes of high schools to meet the educational needs of all students. Small redesign high schools are one option for personalizing education for all students. 1. Smaller high schools can be more flexible. When your master schedule doesn't work for everybody, you can change it. When the length of your school day is a problem, you can change it. When there's an issue that parents are concerned about, you can find a new way of approaching the problem that satisfies their concerns. Why is it written in stone that you must stay on the same master schedule of 4 period-day, 2 semesters every year? Why not be flexible and change your number of periods and schedule to meet the needs of students? With small high schools, everything is on the table and nothing is sacred, making them much more flexible. 2. Smaller high schools can be more responsive to all student needs. In our high school, I often tell potential students that they will be unable to hide in our school. Because of the smaller numbers of students,our staff can more quickly and strategically respond to any kind of crisis, whether that be an academic or a personal crisis a student is having. In a word, we get to know every single one of our students. We know our students as people, not as student ID numbers or test scores. While it is perhaps efficient to know and classify students as numbers and test scores, doing so, means you create cold, impersonal places where efficiency rules at the expense of personalization. Small high schools are nimble enough to respond to students as individuals, not as numbers. 3. In my experience, small high schools are easier to transform into places where diversity is valued and creativity thrives. Large assembly-line high schools are about "controlling" students as they progress through the credentialing system. They have to be to keep the machine running. Students move about the building by bells. They are given very little unstructured time. These schools are about making sure all students conform to the factory's norms so everything runs smoothly and efficiently. Time-on-task means carrying out what the school has determined is productive, not necessarily exploration, inquiry and creativity. In smaller high schools it is easier to have a culture that allows students to think and be independent and critical. That means that students cannot only be themselves, but also value diversity. On the other hand, large assembly-line factories aren't designed to tolerate diversity of thought and creativity. In those schools, creativity becomes a victim of a credentialing system that values conformity above all else. "Just get'em through the system with all the right parts in place." When school districts stubbornly hold on to the idea of large, assembly-line credentialing high schools as the only way of doing school, we are going to continue to fail to meet the needs of all students. While we might continue to increase the number of students stamped with a graduate credential, we will never meet the needs of all students. Those we stamp with appropriate credentials may or may not be outfitted with the tools they need to be successful in life. We need many models of high schools, not one that is the cheapest and most efficient way to deliver graduate credentials to students. How can your “back-to-graduate school” or even undergraduate experience be paperless? It is actually done quite easily by committing to a few simple principles and with a few web tools, desktop apps and tablet applications. Recently, I began working on my EdD, and I made a vow that I was going to avoid the stacks of 3-ring binders, file folders, and textbooks from my previous graduate degree experiences. I still have the notebooks filled with reams of paper stacked in my attic from my two masters degrees and my EdS degree. At some point, I will go through those and place them in the recycling bin, but looking at it now, it seems all a waste. As an administrator, I already try to remain as paperless as possible in my school office, and I wanted to do the same for my current slate of graduate classes under my doctoral in education program. Use no 3-ring binders, no file folders. Avoid printing anything if possible. Purchase only e-copies of textbooks where available. Store all classroom resources in the cloud where they are not as susceptible to loss. If it's scannable, scan it and then recycle it. Utilize technological solutions to help me do all of the above. With these procedures and a few desktop and web applications, my goal is to avoid killing a forest of trees and avoid having stacks of three-ring binders stuffed with paper at the end of this graduate degree experience. Basically, three applications serve as my lines of defense in this fight to stay paperless. The first line of defense in my battle to stay paperless is Evernote. With Evernote, I can place all of my class work in the cloud, by notebook, and access it with any device with Internet connectivity. I simply created an Evernote notebook for each of my classes. In those notebooks, I placed electronic copies of all course documents like the syllabus, handouts, copies of articles, etc. Since PDF is the easiest format to access across most devices, I upload most of these items in PDF format. I have also created an "EdD Task List" for the semester in Evernote too. The end result is I have all electronic copies of class notes, reading notes, articles that have been assigned, links to web resources, and much more in a single notebook. The beauty of this system is that I can access these course notebooks on my laptop, my iPad, my iPhone, my Kindle, and even my work computer as well. This all means I won’t have a stack of three ring binders stacked in my attic upon completing the program. And, because it’s stored in the cloud, I have an automatic backup system too. The second line of defense in my battle to stay paperless in graduate school are e-reader apps. I use Kindle’s app the most, mainly because that’s where I purchase e-copies of my textbooks that are available. So far, in two classes, I have only had to purchase two books that were not e-books. I purchased e-copies of several others. Using the Kindle app across multiple devices also means I have anytime/anywhere access to those books too. I can access them using the Kindle app on my PC, my iPad, my Kindle, and even use the Chrome Kindle Web app. 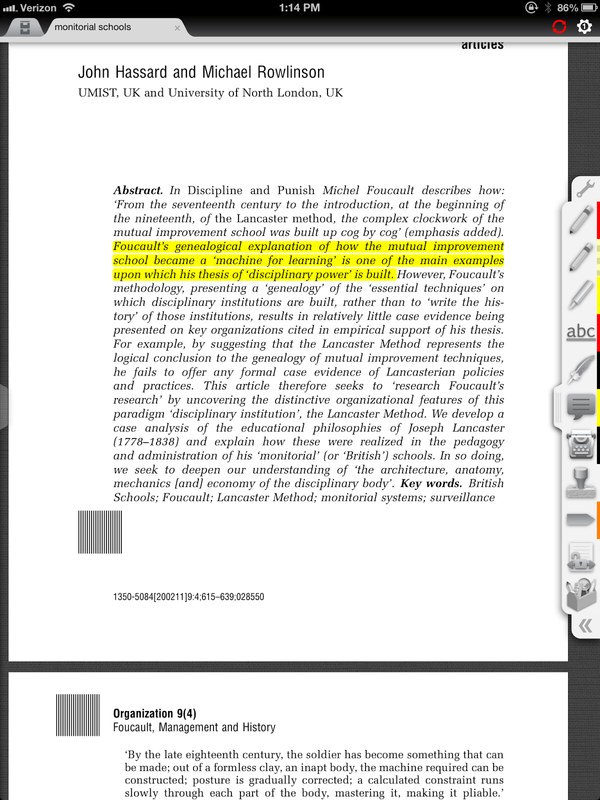 I can highlight text, insert notes, and copy and paste quotes with automatic citations inserted into any document. Using the e-reader apps such as Kindle means I’m not going to have a stack of books to store at the end of this graduate experience. Two other advantages to the Kindle app, are the abilities to email documents to my Kindle account to read, and the use of the Chrome app “Send to Kindle." This app allows users to send web articles to their Kindle accounts with the click of a couple of buttons. Both of these functions mean that I can send relevant articles to my Kindle account and access them across devices too. My final line of defense in the battle to stay paperless while in graduate school are two iPad apps. I say two, because I like both of them so well, I can’t decide which I like better. Those two apps are Goodreader and iAnnotate PDF. These apps both do the same thing: they allow users to read and annotate PDF documents. The only difference I can tell so far are the interfaces. Both seem to have the same features and capabilities. This means those journal articles I collect for class and my dissertation can be stored in my Dropbox or some other cloud service, and then brought into these apps to be read. I can also highlight, underline, and insert comments. These apps give me the ability to read assigned documents and research on my iPad. For those with Android devices, I always liked EZ PDF Reader. It does the same things. So far, I am basically staying paperless. With the right processes, the right electronic devices, the right software, and a cloud service, being paperless can be an attainable goal. We Must Redesign Our Public Schools or Else! Small high schools are necessary because they help school districts fill a niche, that if left unfilled, parents will seek alternatives outside public schools. While I do not consider myself an avid supporter of increasing the number of charter schools and school vouchers, I understand why there's interest in options for schools. Instead of constantly complaining about the increase of charter schools and vouchers, perhaps school districts need to seriously question the design of those schools they are offering parents. School districts can provide parents with high school options, but they must be willing to let go of their preconceived notions about what high schools should look like, and be willing to rethink high school design in general. Around 2005, the Bill and Melinda Gates foundation and others were funding small high schools because it was recognized that large, factory-assembly-line high schools were failing too many kids. If I remember correctly, a study at the time called them "Drop-Out Factories" because there were so many instances of high schools with drop out rates well over 50 percent. Now, many of those once supporting small high schools, including the Bill and Melinda Gates Foundation, have moved on to other educational endeavors. They argued that smaller high schools are more expensive to operate, offer too few educational opportunities as compared to larger ones, and they don't produce the test scores, at least at level of return for the investment. In addition, small high schools cannot churn out "credentialed students" in the same cheap and efficient manner as large, assembly-line, factory high schools. But there's a reason why "drop-out" factories exist. No one-size-meets-every-kids-need high school exists, and I doubt it will ever exist. That's why we need small high schools too. But I can't help but ask, is the goal of a high school to churn out students who have the appropriate credentials stamped in their curriculum vitae, or is the goal of high school to foster individuals who are life-long learners, who are knowledgeable and engaged citizens who can contribute back to society and the world? At the heart of this large high school efficiency model is the mistaken belief that having high school credentials equals potential success later in life. This belief persists in spite of the fact that real skills, dispositions, aptitudes, and habits of mind are the real determinants of success later in life. While statistically, we can say "having a high school diploma" means a student is more likely to graduate and be productive and successful, we forget we aren't dealing with numbers; we're dealing with the lives of real people. Perhaps educational reformers aren't really looking for new and powerful designs for high schools and ways of reforming school; what they really want are cheap and efficient designs. And, in their decision-making efforts, they use test scores, though every educator knows how imperfect those are. Ultimately, when all your thinking centers around values of cheapness and efficiency, you must compromise on others. The result is an imperfect, large comprehensive high school that can't possibly meet the needs of every student. So you turn to credentialing as your sole object, and engage in building large, factory-model high schools that can roll the students through and stamp them proficient as they jump through a series of prescribed hoops and declare them "graduates" when they've completed the hoop-jumping. There are real problems at the heart of this obstinate belief is that only the comprehensive high school can serve the needs of all its students. I have been a teacher for many years in larger, assembly-line high schools, and I have also served as an administrator in them. I have also been principal of a small, redesigned high school too. We know what typically happens in the large assembly-line high school. The top 10 or 20 percent of students get the attention and focus from the school community, which includes top athletes as well. At the other end, students who struggle severely, fail multiple classes, and who are constantly in trouble also receive attention and focus from the staff. There is a large group in the middle who make up the bulk of students. These students are the quiet majority. They make no noise and can exist anonymously in high school for four years.They quietly go about the business of "getting their credentials" so they can graduate. While there have been programs like AVID and others who have tried to target these students, these programs fail to understand a program won't fix this problem. It's a design problem, not a program problem. The design problem is that the whole idea of a large, cheap, efficient credentialing system is simply incapable of addressing the needs of these middle students. These students might be in school. They may or may not have adequate grades. They may or may not be involved in arts or other programs. But the bottom line, they are largely unengaged in learning and are more engaged in just getting their credentials in the form of a diploma and get on with life. The answer for addressing the needs of all students is not to continue to try to tweak the large, assembly-line model high school and force it to serve all students. Large high schools are cheap and efficient credentialing systems, not systems for personalizing education. That model is incapable of serving all students for the same reasons that small high schools can't meet the needs of all students either. Instead of a one-size-fits-all high school, we need a variety of high schools, small and large, academic and career-oriented, theme-based and STEM. Instead of continuing to just build these large, mullti-million dollar relics of the 20th century, we need to offer students and their parents choices. And, as indicated at the start of this, if we don't, they are going to look for solutions outside of public education. 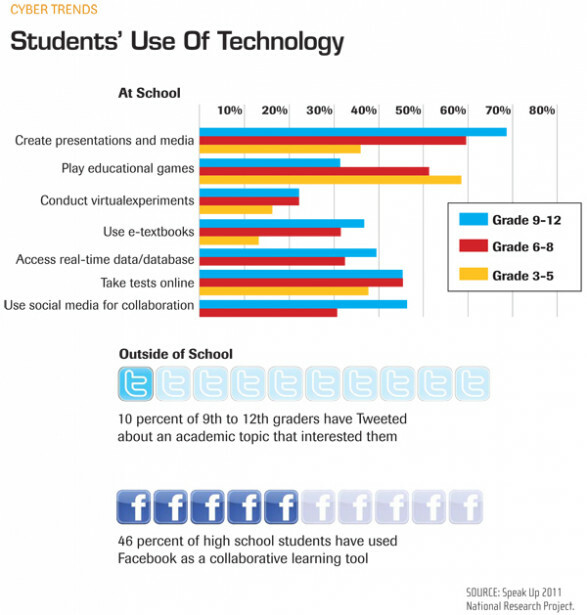 What are we getting students to do with technology in our schools? Here's an interesting infographic from Education Week that offers some answers to that very question. One can only hope that "Create presentations and media" doesn't mean our students are spending a great deal of time engaged in PowerPoint creation. It is interesting, however, that at the high school level that we are getting students to use social media for collaboration fairly often. What is perhaps disappointing and will probably become even more disappointing as these so-called "better assessments" come online is the statistic that we're using technology to take tests almost as much as we use social media for collaboration. Obviously the danger is that we'll turn our computers to testing machines rather than authentic ways to engage in learning and content creation. I'm not really surprised by the outside of school stats. I doubt very seriously that students in the seventies and eighties went home, and by choice, watched educational documentaries unless forced to do so. I know I didn't. Browse more Education Week infographics. With the advent of Common Core Standards, there's a great deal of talk from school districts about moving to Project Based Learning because the kinds of learning asked for in those standards can better be approached through a PBL model. I have heard several districts speak about this change in instructional approach as if it were some kind of basic cosmetic change that could make to their schools. Many still view PBL as instructional strategy that can be added or bolted into their existing schools and classroom systems. Unfortunately, Project Based learning won’t work that way. It can’t be bolted on top of the existing classroom practice. To be successful with PBL requires a fundamental change in teaching philosophy for everyone, from the teacher in the classroom to the school board member. Because teaching is fundamentally different in a PBL classroom, for that instructional model to work, a deliberative effort must be made to establish a “PBL-Friendly Culture,” as Thom Markham calls it in his book, Project Based Learning: Design and Coaching Guide. This is no easy year-long agenda of PBL workshops and get-togethers either. Changing a school into a PBL friendly culture means letting go of a lot of conventional school beliefs and norms and deliberately fostering new ways of thinking about school. Establishing a “PBL-Friendly Culture” basically means to establish and classroom and school that “Builds on Trust and Care.” On the surface, this is a fundamental, must-have shift in thinking, from “controlling students” to moving toward a more learner-centered approach where students have a great deal of autonomy. In practical terms, it means showing students that you trust them by allowing them to take more control of what happens instructionally and culturally in the school and in the classroom. According to Markham, three core factors can maximize our effort and desire to successfully establish a “PBL Friendly Culture” in your classroom, school, or district. Caring Relationships: It is a fundamental truth that people perform better when they know people care about them. If they don’t think people care about them, then instead of engaging in the tasks of the job, they look for escape. In a "PBL-Friendly Culture" a caring relationship begins with recognizing and respecting an individual student's autonomy. This means not seeing students as somethings to be controlled or objects of conformity, but as an individual to be accepted for who they are. It means giving them the freedom to inquire and learn. Autonomy, of course, does not mean there are no rules. It does mean that educators must rethink the nature of rules, in a word, that students don’t exist for rules; rules exist for students. Rules should fundamentally help students become increasingly autonomous. No student is going to perform at peak levels in the cold, impersonal atmosphere where they have no autonomy and the expectation is that they must check who they are at the door. We must care for the students in the classroom to foster in them the desire to perform at the levels necessary for PBL to be successful. The desire for meaning and purpose: In a “PBL Friendly Culture” there’s no place for meaningless work, and busy work is seen as blasphemous. A teacher never, ever gives students work to “just keep them busy.” Assignments and activities must always have a place in the larger goal or purpose of the project. Our students are not dumb. They recognize busy work the minute it hits their desk. There’s no place in the "PBL-Friendly culture" for “Let’s-keep-them-busy-no-matter-what-thinking.” Giving students meaning and purpose in a PBL-friendly culture means doing that everyday all the time. The power of mastery: The key to giving students the “True Power of Mastery” which fosters good feelings about what they've done or are doing, is to give, all-the-time, meaningful and relevant projects and learning assignments. Students feel great when they have completed a particularly self-satisfying project. That makes them want to do even more on the next project. The power of mastery lies in its ability to tap into intrinsic motivation which is a key to establishing a “PBL-Friendly Culture” in your classroom, school, or district. I fear that districts who talk about implementing project based learning across their schools, do not fundamentally understand all the changes necessary for successful implementation of PBL. Fundamental to making PBL work is establishing a culture that respects and accepts students as individuals, and that fosters student effort and desire to learn, not conform and make the next best test scores.